Get free advice and estimates from laundry and dry cleaning professionals in your city. Everyone has laundry to do, and because of this, choosing a washer that is easy-to-use, energy-efficient, and cost-effective can make the entire experience a breeze. As you start to shop for a new washer, you will have the choice of a front-loading or top-loading washer. Below, we discuss the differences to help you make the right choice for your home. When it comes to energy-efficiency, front loaders are your best option. Studies conducted by Good Housekeeping and Consumer Reports show that front loaders are much more efficient than top loaders when it comes to water and energy use. The reason for better efficiency is because front loaders only partially fill with water during each cycle as opposed to top loaders, which add enough water to cover the clothes entirely. The amount of water used directly impacts the water efficiency of each washer. Front loaders are more energy-efficient when using warm or hot water because they use less overall and decrease the amount of energy needed to heat the water used. Front-loading washing machines use less water overall and, as mentioned above, this allows them to be more energy-efficient than top loaders. Front loaders scored excellent in a water test conducted by Consumer Reports, which showed that these washing machines used about 13 gallons of water or less per eight-pound laundry loads. 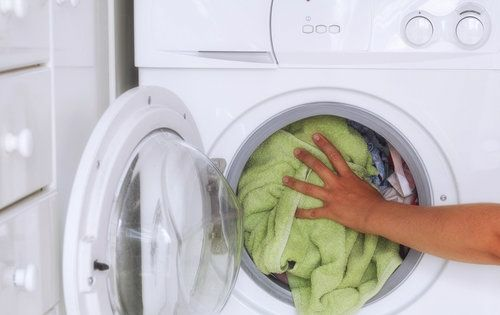 Top-loading washers were tested for water usage by Consumer Reports as well, and some of the worst scoring washing machines used about 27 gallons of water to wash an eight-pound load of laundry. To save as much water as possible, measure and use the appropriate amount of detergent. Utilize high-efficiency (HE) detergents for HE washers and front-loading washers because traditional detergents cause more suds, which can result in longer rinse cycles or repeated rinse cycles. Also, choose the proper water setting to save on water and never overstuff the washer, which can cause an imbalance with the agitator, leading to additional water usage. Generally speaking, front-loading washers have more capacity than top-loading washers and can hold larger loads of laundry without sacrificing the quality of clean. Standard and high-efficiency top-loading washers typically range between 3.1 to 4.0 cubic feet in the size of the tub. Front-loading washers and HE front-loading washers typically range in size from 4.0 cubic feet up to 5.0 cubic feet. When it comes to cleaning performance, front-loading washers offer a better clean in most cases. 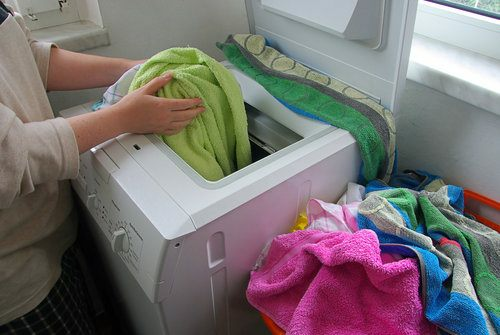 If you overstuff a top-loading washer, expect the clothes to remain dirty because the washer will not be able to properly agitate the clothes. Traditional top loaders have a pole-style agitator that works to move your clothes around to get them clean. A front-loading washer works to move your clothes around inside of a drum and keeps the clothes constantly in motion. Because of this, you experience a better clean of your clothes. Front loaders also spin the clothes faster, which means all of the water and detergent is removed from them. Also, front-loading washers have a larger capacity and are designed to allow you to wash large items without the fear that your comforter will become trapped around the agitator and throw the entire machine off balance. Installation of both washers is considered easy and does not have to be done by a professional, although it is recommended if you do not have experience in installing washers. Typically, they both require you to remove the old washer and place the new one where you want it, followed by matching up and connecting the appropriate hardware. A top-loading washer does not require as much room since you do not have to swing the door open. Front-loading washers range in price depending on the size of the unit and its additional features. The cost of a front-loading washer that has a 4-cubic foot capacity is between $590 and $1,300. In addition, expect to pay anywhere between $100 and $165 for the labor to install it. Supplies, which often include cords and lines, cost anywhere between $15 and $25. You would be looking at a total cost of $705 to $1,490 for a 4-cubic foot capacity front-loading washer. Top-loading washers also range in price depending on the size and features, however, the differences in price are not too drastic. The cost of a top-loading washer that has a 4-cubic foot capacity will run between $300 and $500. In addition, expect to pay somewhere between $100 and $165 for installation and from $15 to $25 for supplies. You would be looking at a total cost of $415 to $690 for a 4-cubic foot capacity top-loading washer. Overall, front-loading washers are quieter and provide less vibration. This is because they come with a wide range of features that allow you to control the noise and vibration experienced. Since front-loading washers use a drum and not an agitator pole, you do not have to worry about the knocking and banging if your washer becomes unbalanced. When comparing washers, top loaders have a shorter cycle time, which means that you can do more loads throughout the day. In fact, top loaders often complete a cycle in about 15 to 30 minutes depending on the settings you choose. Front loaders take longer to complete cycles and may run for as long as an hour. The reason is that the front loader uses a barrel that spins the clothes around, which means only a portion of the clothes hit the water at any given time. While the front loader takes longer, the cycle results in a better clean and less wear. Top loading have a significant amount of lint buildup after washes because of the friction created with the clothes as they are washed and agitated. Since front loaders do not agitate the clothes, lint buildup is not as prominent. In fact, many high-efficiency front loaders have a specialized lint pump that flushes lint from the system instead of a lint trap. Traditional front loaders have lint traps that should be cleaned on a regular basis, even though lint buildup is not as bad. When it comes to convenience, a top-loading washer is one of the best choices. This is because you can easily add and remove your clothes from the washer without having to bend over. Because of this, many individuals who have trouble bending over or standing in a stooped position choose a top loader. While front-loading washers offer convenience and are more energy-efficient, they are not as easy to use. You need to bend down to use the front loader, which may be troublesome for those who have back problems or suffer from mobility issues. Because of this, it also makes the front loader more difficult to load and unload. How much does it cost to install a front-loading or top-loading washing machine. in my city? Cost to install a front-loading or top-loading washing machine. varies greatly by region (and even by zip code). To get free estimates from local contractors, please indicate yours.